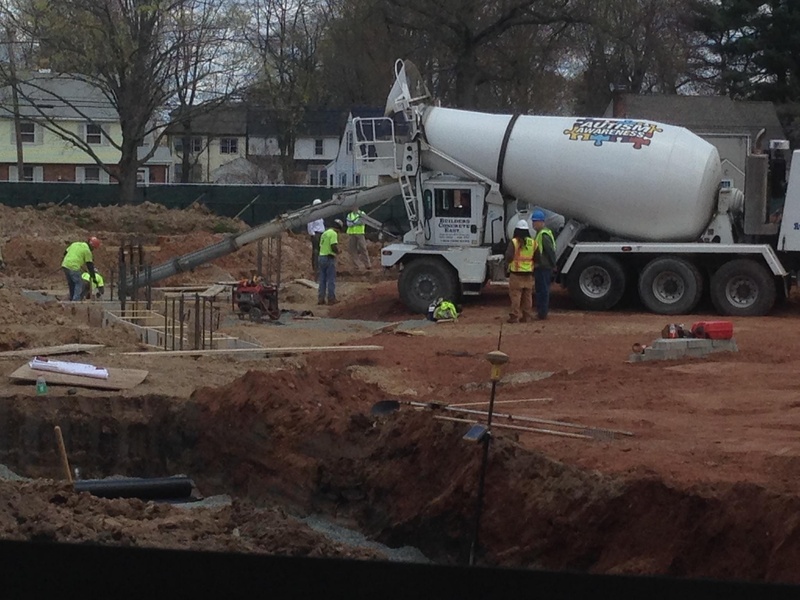 The first concrete foundation was poured on Thursday!! See the photos below courtesy of Assistant Superintendent Andy Morrow and our Clerk of the Works Chris Cykley. The rerouting of the fiber communication line (internet and telephone lines) was completed on Wednesday evening and went flawlessly!! Under drain piping installation continued on the south side. The permanent fence is installed across the front of the existing building. There are 2 gate locations, one at the front door to the building and one on the playground that will be used periodically - other wise they are secured and kept closed. IMPORTANT!! Drainage work at the intersection of Sidney and Oakwood Avenues is scheduled for Tuesday May 5th and Wednesday May 6thand will consist of replacing the current man hole and reconnecting several pipes. There will be sidewalk closures and pedestrian detours at the intersection of Sidney and Oakwood Avenues and traffic will be limited to one alternating lane. We will have additional staff and police assisting with pedestrians and traffic control. If possible, please consider using Flatbush Avenue along Sterling Field as the drop off and pick up point and use the sidewalk from the bus drop off to access the school. See the diagram below for more information. Excavations for foundations will continue and more concrete will be poured. The rerouting of the electrical lines from Flatbush Avenue to the existing building is nearly complete and the changeover is scheduled for Saturday May 9th. There will be no power that day in the school. Drilling for the geothermal wells is scheduled to begin on Monday, May 11th.